The Damascus DMZ-33 Nitro Tactical Gloves are built for protection and flexibility. The Kevlar® fabric is extremely durable and provides protection against both cuts, flames and flash fires, making them suitable for a wide range of field and tactical applications. Rugged black CarbonTek® plates across the knuckles protect the joints against impacts. The palm is made from tough, premium cowhide, complete with a digital print that provides additional friction for improved grip and security. 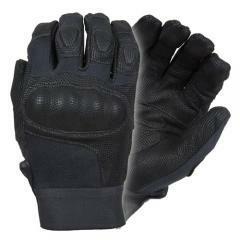 The material is flexible as well as durable, making the gloves an ideal choice for on duty tasks, such as firearm use. The rolled fingertip design aids with trigger fit and control. Velcro® wrist closures complete the glove, delivering a secure and comfortable fit.